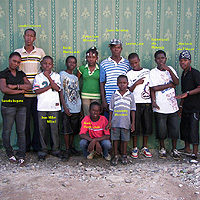 Ti Moun Rezistans is the name of the group of children ranging from 6 to 18 years old that have been learning art skills from older artists in the neighbourhood. All the children exhibit their work around the ateliers. They all took part in the Ghetto Biennale, notably creating a great performance work called 'Tele Geto'.